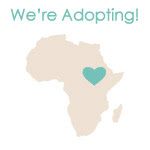 We will be adopting our first child from Ethiopia! In July of 2010 after the staggering statistic of the number of orphans in the world (over 147 MILLION!) was made known to me, I could not get this overwhelming number out of my mind. I came across this inspiring story at www.weloveourlucy.blogspot.com and could not get the issue of orphans off my mind (watch her beautiful "Gotcha Day" video and you won't be able to either!). I spoke with Christopher about it, both of us figuring that this would be something that we might pursue down the road after we had "children of our own." In the meantime, God gave me numerous signs to let me know I was on the right track. One sign came through the Minnovich family. One of their sons (who they brought home to their family from Ethiopia) is involved in Student Council at the school where I teach. I have had the privilege of getting to know him and have e-mailed his wonderful mother Tracey. Read their story at http://www.ourunveiledfaces.blogspot.com/. Another sign came through my high school friend Katie. She and her husband Brent actually made me first think, "If adoption is that important to me, why not adopt first?" They are also adopting from Ethiopia. You can check out their story at http://www.journeytothreeormore.blogspot.com/. Well, after not being able to get the idea out of my mind, I told Christopher that I was very serious and no longer thinking "down the road", but for our first child! This heavy conversation actually took place at Waffle House! I just knew he'd say I was crazy, but to my surprise he said, "I knew you were serious about it." (I don't know what gave it away. Maybe it was the HOURS I spent on the computer researching and blog stalking!). He went on to tell me that he wanted the same things for our future family. I kept praying for Christopher to be ready. And on December 29th, he said he wanted to fill out the pre-application! So we're on our way! I couldn't think of any way that I would have rather rung in the new year! Whew! If you're still reading, thank you! I tried to sum up a 5 month journey in one post! In my next post, I will answer the question, "Why Ethiopia?"